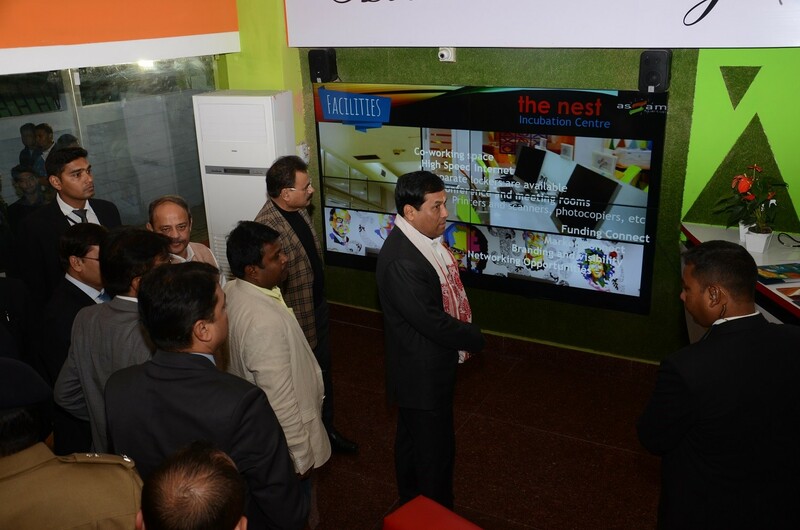 Assam CM, Sarbananda Sonowal inaugurates the start-up , the Nest. Photo: DIPR, Assam. GUWAHATI: Assam Startup – The Nest, the first of its kind, state-owned incubator for start-ups, was launched here on Sunday with the objective of giving a boost to the start-up eco-system and support budding entrepreneurs. The Assam government has set up the incubator in association with IIM Calcutta Innovation Park. Assam chief minister, Sarbananda Sonowal inaugurated the incubator as part of the “Assam Startup Policy 2017” on Sunday evening amidst primarily a young crowd comprising students from across various districts and entrepreneurs. Speaking on the occasion, Sonowal urged youths to be job creators and make the startup initiative a movement. “This incubation centre is a product of ‘Advantage Assam’, the global investors’ summit held here in February last year and I am glad to inform you that about 240 agreements have been signed with frontline companies who have committed to invest about Rs 79,000 crore in the state. Till date, Rs12, 000 crore has been invested in the state which will benefit 50,000 youths,” he said. The chief minister also reiterated the long-term plan of making Assam a powerful hub of Southeast Asia with Guwahati as its gateway. Sonowal also launched the Assam Startup portal, startup.assam.gov.in, which will be a one-stop solution for start-ups. The centre has facilities such as co-working space, lockers, high-speed internet, conference and meeting rooms, shared services desks, et al for selected start-ups. More importantly, the centre, located at Ambari, will provide dedicated mentorship, capacity enhancement training, market connect, networking opportunities, branding and visibility and funding connect. Additional chief secretary, industries and commerce department, Ravi Capoor informed that between 50 and 100 “game-changing” ideas would be selected during the first year, to be mentored by experts from IIM Calcutta and thereafter supported by the state government. “However, only ideas which are innovative with an input of technology, and can be scaled up, would be in the reckoning for selection. Once selected, the start-ups would be provided free working space, legal assistance, et al. Besides, after mentoring, there would be access to funds from a network of angel investors and venture capitalists,” Capoor said. He further said that with the clearance of the start-up policy by the chief minister, “brilliant ideas” could also get a support of up to Rs 50 lakh from the state government.